I have no time-travelling experience! A few hours after Pearl Mackie was unveiled as Doctor Who's new companion, a fan posted a selfie on Facebook dressed as her character. Given that all he'd had to go on was a brief trailer of Mackie and the Doctor cowering from Dalek unpleasantness, you had to admire his handiwork. "I couldn't believe he'd managed to look like me so quickly," says Mackie. "Purple jacket, big afro - he nailed it, man." It was the 29-year-old Londoner's first brush with the strange world of Doctor Who fans. Nothing like that happened when she appeared in the West End in The Curious Incident of the Dog in the Night-Time. Or when she played Anne-Marie Frasier on the BBC soap Doctors. Still less when she sang in a band called Freddie and the Hoares. This will become your new normal, I tell Mackie, over coffee in Brixton Market, near the flat she shares with a friend. We survey the lunchtime crowd: the fishmonger, the passing evangelist urging us to mend our ways, the man with a huge dog named Lenny. In less than three months, I say, when the Doctor's new companion is introduced in the Christmas special, they will be queuing up to take selfies with you. "It's already happening;' says Mackie. "The other day, I was in my friend's shop and this French guy comes in. I say, 'I don't work here, but someone will be with you in a minute: He says, Won, non, non! 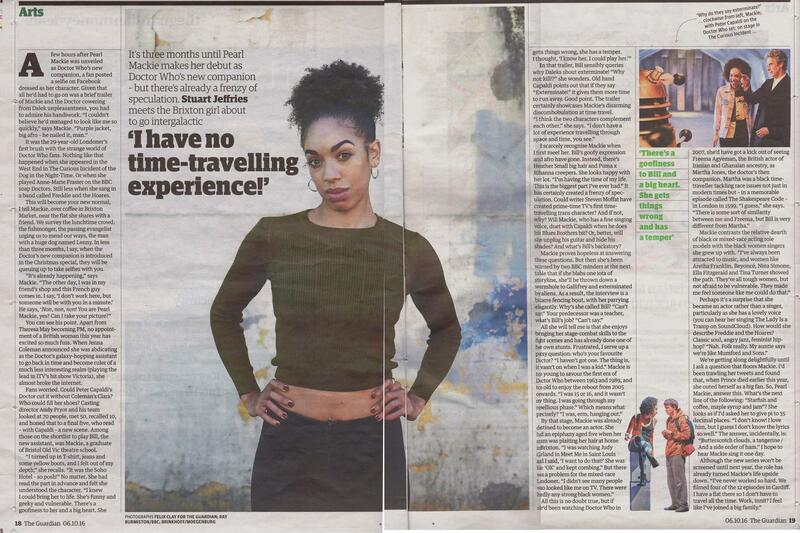 You are Pearl Mackie, yes? Can I take your picture?" You can see his point. Apart from Theresa May becoming PM, no appointment of a British woman this year has excited so much fuss. When Jenna Coleman announced she was abdicating as the Doctor's galaxy-hopping assistant to go back in time and become ruler of a much less interesting realm (playing the lead in ITV's hit show Victoria), she almost broke the internet. Fans worried. Could Peter Capaldi's Doctor cut it without Coleman's Clara? Who could fill her shoes? Casting director Andy Pryor and his team looked at 70 people, met 50, recalled 10, and honed that to a final five, who read - with Capaldi - a new scene. Among those on the shortlist to play Bill, the new assistant, was Mackie, a graduate of Bristol Old Vic theatre school. "I turned up in T-shirt, jeans and some yellow boots, and I felt out of my depth," she recalls. "It was the Soho Hotel - so posh!" No matter. She had read the part in advance and felt she understood the character. "I knew I could bring her to life. She's funny and geeky and vulnerable. There's a goofiness to her and a big heart. She gets things wrong, she has a temper. I thought, 'I know her. I could play her:"
In that trailer, Bill sensibly queries why Daleks shout exterminate! "Why not kill!?" she wonders. Old hand Capaldi points out that if they say "Exterminate!" it gives them more time to run away. Good point. The trailer certainly showcases Mackie's disarming discombobulation at time travel. "I think the two characters complement each other;' she says. "I don't have a lot of experience travelling through space and time, you see." I scarcely recognise Mackie when I first meet her. Bill's goofy expression and afro have gone. Instead, there's Heather Small big hair and Puma x Rihanna creepers. She looks happy with her lot. "I'm having the time of my life. This is the biggest part I've ever had." It has certainly created a frenzy of speculation. Could writer Steven Moffat have created prime-time TV's first time-travelling trans character? And if not, why? Will Mackie, who has a fine singing voice, duet with Capaldi when he does his Blues Brothers bit? Or, better, will she unplug his guitar and hide his shades? And what's Bill's backstory? Mackie proves hopeless at answering these questions. But then she's been warned by two BBC minders at the next table that if she blabs one iota of storyline, she'll be thrown down a wormhole to Gallifrey and exterminated by aliens. As a result, the interview is a bizarre fencing bout, with her parrying elegantly. Why's she called Bill? "Can't say." Your predecessor was a teacher, what's Bill's job? "Can't say." All she will tell me is that she enjoys bringing her stage-combat skills to the fight scenes and has already done one of her own stunts. Frustrated, I serve up a patsy question: who's your favourite Doctor? "I haven't got one. The thing is, it wasn't on when I was a kid:' Mackie is too young to savour the first era of Doctor Who between 1963 and 1989, and too old to enjoy the reboot from 2005 onwards. "I was 15 or 16, and it wasn't my thing. I was going through my rebellious phase." Which means what precisely? "I was, erm, hanging out." By that stage, Mackie was already destined to become an actor. She had an epiphany aged five when her mum was plaiting her hair at home in Brixton. "I was watching Judy Garland in Meet Me in Saint Louis and I said, 'I want to do that!' She was like 'OK' and kept combing:' But there was a problem for the mixed-race Londoner. "I didn't see many people who looked like me on TV. There were hardly any strong black women." Mackie contrasts the relative dearth of black or mixed-race acting role models with the black women singers she grew up with. "I've always been attracted to music, and women like Aretha Franklin, Beyonce, Nina Simone, Ella Fitzgerald and Tina Turner showed the path. They're all tough women, but not afraid to be vulnerable. They made me feel someone like me could do that." Perhaps it's a surprise that she became an actor rather than a singer, particularly as she has a lovely voice (you can hear her singing The Lady Is a Tramp on SoundCloud). How would she describe Freddie and the Hoares? Classic soul, angry jazz, feminist hip-hop? "Nah. Folk really. My auntie says we're like Mumford and Sons." We're getting along delightfully until I ask a question that floors Mackie. I'd been trawling her tweets and found that, when Prince died earlier this year, she outed herself as a big fan. So, Pearl Mackie, answer this. What's the next line of the following: "Starfish and coffee, maple syrup and jam"? She looks as if I'd asked her to give pi to 35 decimal places. "I don't know! I love him, but I guess I don't know the lyrics so well:' The answer, incidentally, is: "Butterscotch clouds, a tangerine / And a side order of ham." I hope to hear Mackie sing it one day. Although the new series won't be screened until next year, the role has already turned Mackie's life upside down. "I've never worked so hard. We filmed four of the 12 episodes in Cardiff. I have a flat there so I don't have to travel all the time. Work, innit? I feel like I've joined a big family." APA 6th ed. : Jeffries, Stuart (2016-10-06). I have no time-travelling experience!. The Guardian p. 18. MLA 7th ed. : Jeffries, Stuart. "I have no time-travelling experience!." The Guardian [add city] 2016-10-06, 18. Print. Turabian: Jeffries, Stuart. "I have no time-travelling experience!." The Guardian, 2016-10-06, section, 18 edition. This page was last modified on 13 October 2017, at 23:30.